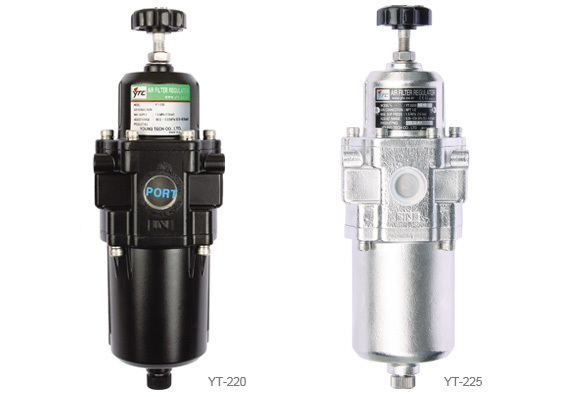 YT-220(YT-225) receives main air pressure and supplies to the desirable level pressure to a positioner or other devices. 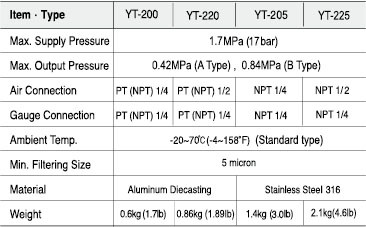 - Maintains desirable pressure level, regardless of fluctuation of pressure input. - Aluminum body increases versatility of the product in different environments. - 5 micron filter sorts minuteness particles in the air. - Relief function is available which discharges to atmosphere if the outlet pressure is higher than setting pressure.